Searching for a 1964 Dodge Polara? There’s a good chance you live in Alaska, suggests a survey by ClassicCars.com. In a state-by-state report issued by the website, which specializes in researching and purchase of classic automobiles and trucks, more Alaska residents searched for the Polara than any other collector car. 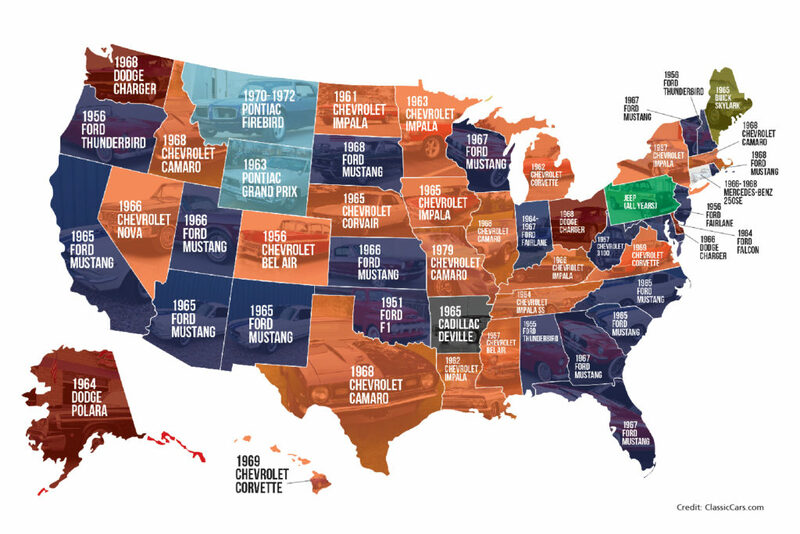 Alaska was one of four states favoring Dodges, according to ClassicCars. The others are Washington and Ohio (1968 Dodge Charger) and Delaware (1966 Dodge Charger). But the Dodges couldn’t hold a spark plug to Ford and Chevrolet, which won the most states by far. Overall, Fords and Chevrolets were the most-searched vehicles in 20 states each, followed by Dodge, Pontiac (two), and Buick, Jeep, Mercedes-Benz and Cadillac (one each). Domestic models won 49 states, with 1966-68 Mercedes-Benz the lone import, winning in Connecticut. Ford dominated the Southwest, Southeast and Northeast, while splitting the Midwest with Chevrolet, which received more scattered results from Hawaii to New York and Massachusetts. The Ford Mustang “Pony Car,” which generated 3.7 million unique searches and won 13 states in 2016, was the favorite classic in nearly double the number of states as second-place Chevrolet Impala, which generated the most searches in seven states. The Mustang and Impala were followed by the Chevrolet Camaro (five states), and the Chevrolet Corvette, Ford Thunderbird and Charger (three each). Other winners were 1970-72 Pontiac Firebird (Montana), 1963 Pontiac Grand Prix (Wyoming), 1965 Cadillac DeVille (Arkansas), Jeep brand (Pennsylvania) and 1965 Buick Skylark (Maine). Two states were dominated by pickup trucks: Oklahoma residents preferred the 1951 Ford F1 and West Virginians favored the 1957 Chevrolet 3100. “Owning pristine collector vehicles – particularly domestic performance and muscle cars – continues to be a passion for many Americans, from the most-seasoned collectors to enthusiasts making their first purchase,” said Roger Falcione, president and CEO of ClassicCars.com. Among European models, the Volkswagen Bus was of greatest interest with 240,656 unique searches, while the Datsun 280Z led Japanese models at 157,265 searches. ClassicCars.com reports 330,000 searches a day and three million unique visitors monthly.